Welcome to the international home of Agazarian cymbals and gongs. Feel free to explore our ever growing line of top-quality cymbals, distinctive Hubei Province gongs and durable stands. Check back often as we expand our product selection. 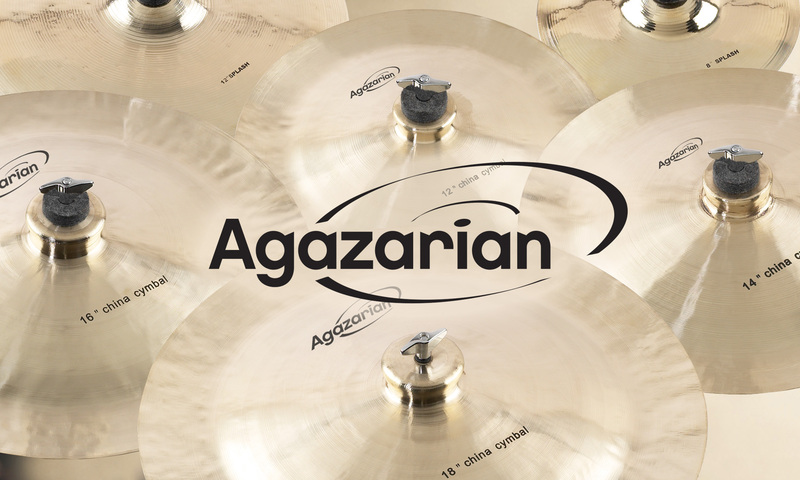 Each Agazarian cymbal is made individually, making a unique instrument with distinct acoustic characteristics. The process has remained virtually unchanged for over 2000 years. These distinctive splash cymbals will add unique, colorful accents to any kit. Splash cymbals are available in 8″, 10″ and 12″ sizes. Agazarian traditional china cymbals are individually handmade with manufacturing techniques that were pioneered hundreds of years ago. Each cymbal has its own perfected, yet unique acoustic characteristics. The china will give you plenty of trash with a balanced wash. The Agazarian Chau Gong with Mallet — also known as a Tam-Tam — is carefully handcrafted in the centuries-old tradition from the Hubei Province of China. Born from the fired cast of a distinctive bronze alloy, this Chau gong brings a big, deep crash sound, providing a large spread of low tones with intricate characteristics for both performance and recording situations. From a sustained drone to a building crescendo of fast explosive crashes, this hand-hammered gong with its raw “bull’s-eye” center works in symphonic applications. It also plays well in a variety of other musical genres, blending with a wide array of other instruments. Gong sizes include 26”, 30” and 34”. Gong mallet included. The 22″ Agazarian Wind Gong with Mallet — also known as a Feng Gong — is individually crafted by hand in the centuries-old tradition from the Hubei Province of China. The almost flat design of this gong takes its shape through hand hammer and lathing, and when played, offers vibration, which spreads out exceptionally wide with a long sustain. The distinguishing smooth sound is mostly low-pitched, yet can open up nicely with a wash of overtones when played more aggressively. Offering a shimmering sound for traditional ceremony, this gong can also complement a variety of other musical styles. Also try playing it as you would a ride cymbal with a traditional drumstick and you will get a great deep, dark trashy ride sound. Gong mallet included.